I think it's time for his first haircut, yes or no? Look at those curls!! haha, such a cute pic! Yes. And time to start weaning off that pacifier. Right, Dentist Dad? lol...oh so cute as a button! LOL! Isn't he just the cutest thing ever?! My big kiddo didn't have his first until he was nearly 2-1/2. I was so afraid he'd lose those baby curls, and he did. And my daughter turned three on Nov. 1 and still hasn't had one; although, she doesn't have the curls, there's sillt something about that sweet, fine, soft, baby hair that keeps them little just a while longer. Hugs! I have to say yes. But he is sooo cute! 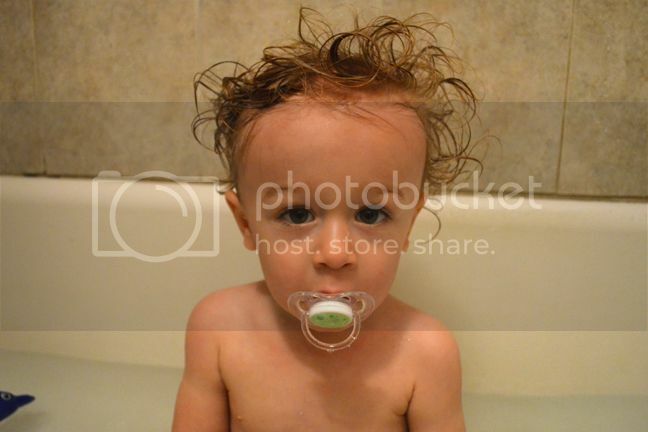 Keep the hair, loose the pacifier! OH MY! This is the cutest little pic ever! LOVE his hair! I have to say that when our friends cut their son's hair--he didn't look so little anymore. His look totally changed. Either way--I think Fox will look super cute!